Sorry for the quality of today’s shot but I had a hard time getting the subject to pose where there was decent lighting. 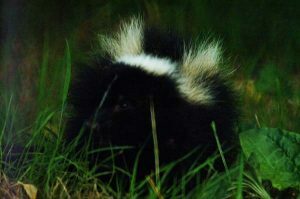 We’ve seen a couple of skunks in the yard this week, and fortunately they seem to be in a hurry to get somewhere else. Also, they come around at an hour when the cats are safely inside and they aren’t tempted to introduce themselves.